Steve Matthiasson gave a presentation to wine professionals recently at Matsuhisa in Vail. Matthiasson is passionate about vines. “You can see here the panic in this vine,” said Steve Matthiasson as he pointed to a photo of a skinny, spindly wine vine. The “low-vigor” vine looked like the Christmas tree in a Peanut’s cartoon. Listening to Steve’s voice, you could feel his genuine empathy for the vine’s plight. It evidenced how emotionally connected the California winemaker is to the soils, the wood, and the fruit from which he makes his wines. Few Napa winemakers have accrued as much acclaim in recent years as Matthiasson. 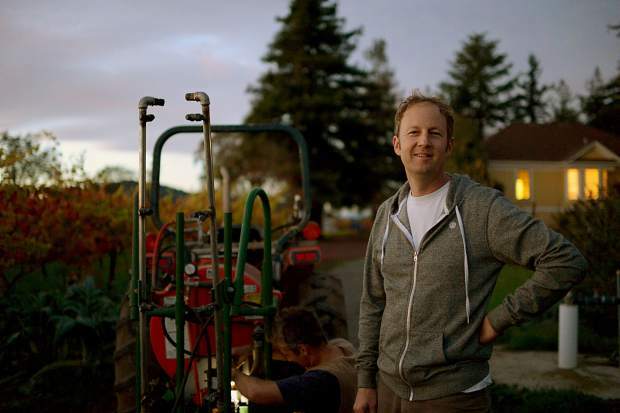 Both Food & Wine Magazine and the San Francisco Chronicle have named him winemaker of the year. He was nominated for a James Beard Award. Cult collectors gobble up his wines on release. And folks from throughout the wine industry covet an invitation to join Steve and his wife and partner, Jill Klein, a pioneer in the “Farmer To Farmer” sustainability movement, for the suppers they make for friends and family at their California farmhouse in the Oak Knoll appellation of the Napa Valley. Their fellow vintners and journalists come for the opportunity to hear the agricultural evangelists deliver an homage to the importance of balance in vineyards and in wines. “Food, family and local Ag,” Steve says with a smile when discussing what makes him tick. To hear Steve talk, as I did one recent afternoon at a presentation he delivered to a gathering of wine professionals at Vail’s Matsuhisa restaurant, it is easy to see that the vines, even more than the wines, capture his passion. After a stint at UC Davis, he began his career working in pest management and viticulture in the San Joaquin Valley. He went to Lodi, Calif., with plans to specialize in vineyard management, not to make wine. In 2001, he started Premiere Viticulture, a company to consult with winemakers on their vineyards, and moved to Napa. It was not until 2003 that he and Jill started making wines under the Matthiasson label. Now wine production has been turned from the inside to the outside. And much of it is a result of his doing. Today, Steve’s mantra is that a balanced vine makes a balanced wine. But a balanced vine takes more than a little work. There must be a combination of the right soils, the right drainage, the right ground cover, the right canopy. All of that and we have not even gotten to the vines yet. As a viticulturist, Steve, for both his own wines and those he consults on, is obsessed with the details. He looks at a vineyard as a collection of individual vines with canes and shoots and clusters, and believes that each element must be precise to support the fruit that hangs. In his presentation, which he gives around the world to vintners, there are photographs of lush, high-vigor vines with massive clusters of grapes. “Not healthy,” according to Steve. He points out that vines of high vigor are more prone to disease. But then there are also photos of other vineyards that have been pruned and culled in order to produce lower yields and, in theory, better grapes. Again, not healthy, and actually kind of stupid according to Steve. “Why would you spend the money on a Napa vineyard and then only use part of it to make wines? A low yield does not necessarily make a great wine. But a well balanced yield does makes a great wine,” Steve said. He goes on to say that he once pulled 7 tons of Chardonnay off an acre of in his Linda Vista vineyard, more than double what would generally be considered an appropriate yield. But he can do that because he pays attention in the vineyard, making sure that there is proper spacing between the rows, the vines, and the clusters. That the canopy is cut to allow the sun and the heat to ripen each cluster in the same fashion, that the ground cover does not siphon away, or leave too much, moisture. It’s about doing the work in the spring. It is about paying attention to the sources, the earth, the vines, and the grapes, and giving them the best possible chance to make great wine. No wonder he cares so much.